So I just returned from a trip to Florida a few days ago. I had such an amazing time seeing my family, Preston's family, and a few friends! 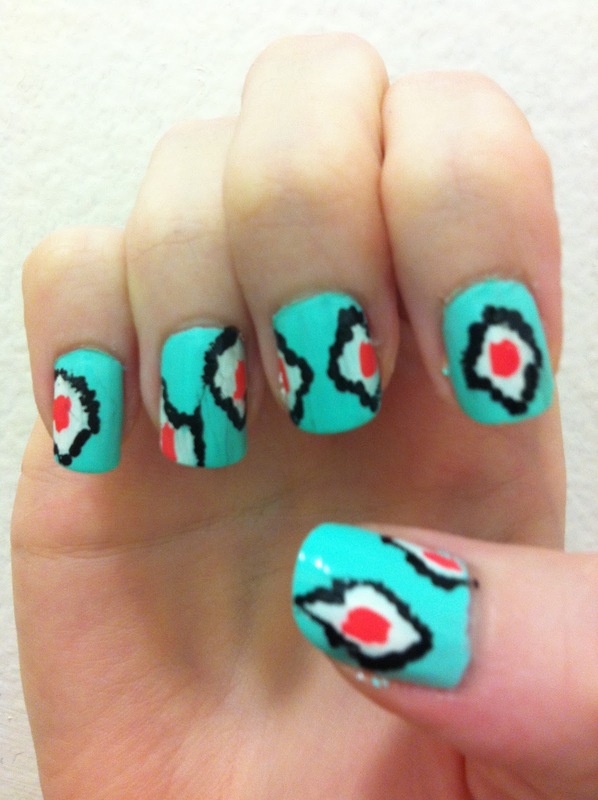 Before I left, I painted my nails using an Ikat design inspired by this video by Miss Jen Fabulous. I have been watching so many of her videos lately. She shows great designs and demonstrates them in such a simple, easy way. 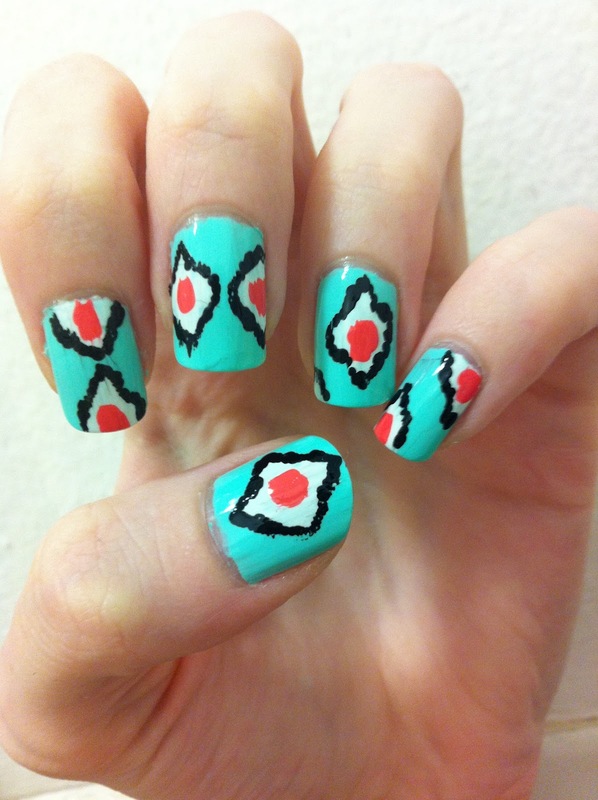 I have been loving the Ikat design for clothing, home goods, and accessories and was so excited to see how to translate this into nail art. Below, I'll talk about how I did this, but for a complete tutorial definitely check out the video linked above! Mint & Coral are my favourite colour combination of this summer & I thought they would look perfect for this design. I started by painting my nails with two coats of CC Blue-Ming. Next, I painted white diamond shapes using a small brush. These I scattered around my nail, some nails have two parts of a diamond, some have a whole diamond. Then, I added the coral to the center of the shapes. Finally, I added the black outline using a bobby pin as a dotting tool. You could add a black dot to the center as well, but I left that out (I completely forgot & had already painted my top coat!) Finish up with a clear top coat. 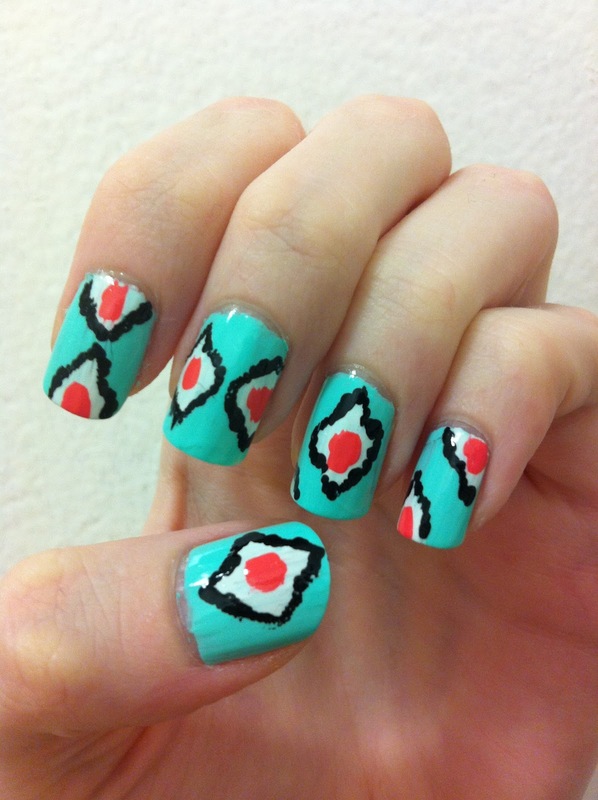 & now you have Ikat nails! I think this design would be great with so many different colour combinations, as well as shapes and layouts. With the rough edges of the design, you don't have to worry about being perfectly straight. This print is perfect for summer with its tribal/southwestern flair, and I received so many compliments on it, from friends & family to the flight attendants on my way to Florida! It is also super easy to execute. I will definitely be doing this print again with other colour combinations and layouts. 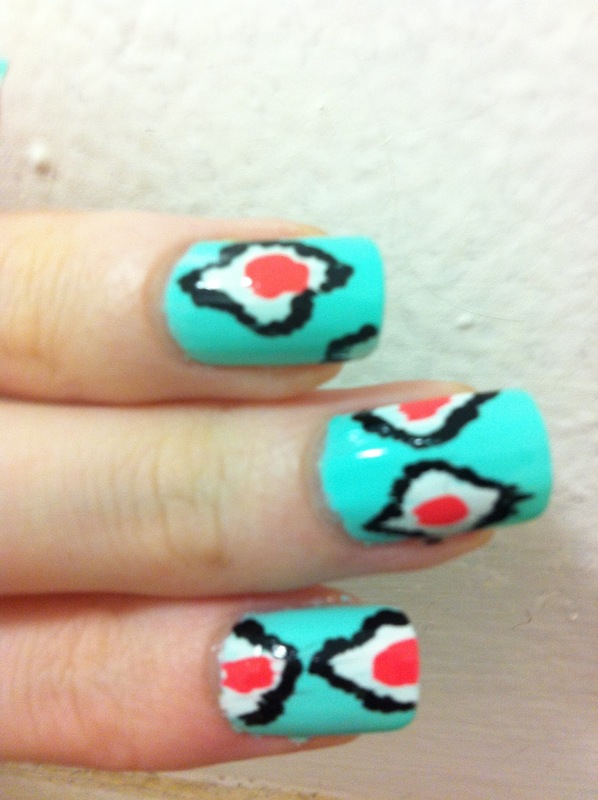 Just looking at these pictures makes me want to paint my nails like this again!